We conducted the survey as part of our mission to understand the world of co-ops and make that knowledge accessible. The results published here hold a mirror to the co-op sector, not only identifying important issues but also providing clear areas for collaboration for both advocacy and research. We selected our informants based on their specialized knowledge about co-ops. The 2017 survey included a sample similar to last year’s — CEOs, board members, managers, and academics balanced by region, sector, and role within the co-op. 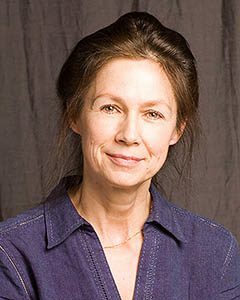 Their knowledge is invaluable because it is extensive, detailed, and privileged. Our forty-three key informants identified many issues, which we have analysed and organized under themes that include maintaining the co-op identity, government relations, organizational change, member commitment, relevance, innovation, technology, and governance. Four themes were common to both the 2016 and 2017 surveys: public awareness, competitiveness, youth engagement, and co-operation among co-ops. 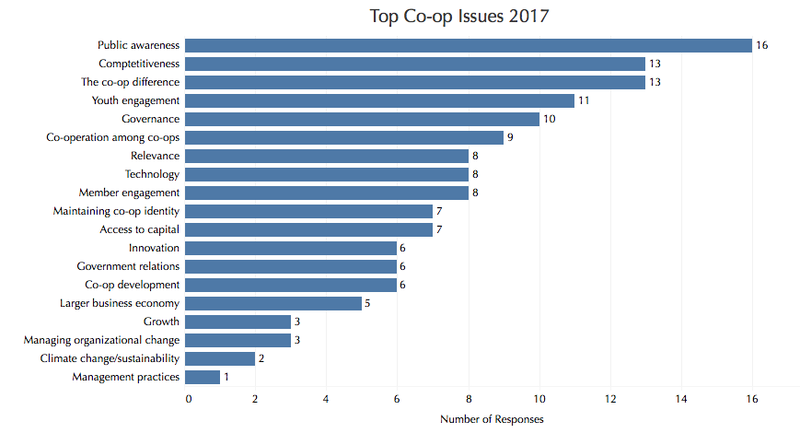 Interestingly, public awareness and co-operation among co-ops more or less changed position, with public awareness jumping from fifth in 2016 to first in 2017 and co-operation among co-ops dropping from first last year to sixth this year. Other notable moves included governance jumping from tenth in 2016 to fifth in 2017, the co-op difference moving up from eighth to third, access to capital dropping from fourth to tenth, and government relations making an even bigger dive from third to twelfth. Items such as relevance to contemporary needs and concerns about technology remained consistent across both years, around the middle of the pack. But issues one might think would be of significant interest such as growth, organizational change, leadership, and management practices were low on the scale in 2016 and barely registered in 2017. The rise of the governance theme reflects the growing awareness among organizations of all types that governance is a critical determinant of success or failure; not surprisingly, governance is also an increasingly important topic in the academic literature. The much stronger interest in the co-operative difference this year may indicate an understanding among co-ops that differentiating your organization can not only help re-engage members but may also be the key to substantial advantages in the marketplace. Combining the two — focusing on the co-op difference while practising good governance — may give co-operative organizations the strong foundation they need to thrive in the broader business environment. This year’s survey, as did that of 2016, revealed a wealth of information about what co-op leaders across Canada are thinking about their organizations as well as many practical suggestions for addressing challenging issues. Watch this space for a discussion of these action items. This entry was posted in Governance and tagged co-op identity, co-op issues, co-operation, competitiveness, governance, government relations, growth, leadership, management, member engagement, organizational change, public awareness, relevance, youth engagement by Nora Russell. Bookmark the permalink. Thanks for this report and will share it with colleagues at the UK Co-operative College. Hope to use this information as we are working to help revive the African movement. We are working on Zambia at the moment and we would like to partner with Canadian co-ops to help rebuild the African movement.